Have you always wanted to try Pilates but not exactly sure what it involves and whether it would be suitable for you? Read on to find the answers to some of the most common questions you may have about Pilates. Pilates is a form of exercise which concentrates on building your body’s core strength through a series of low repetition low impact stretching and conditioning exercises. Through Pilates, you will be able to develop the muscles in your back, abdominals and pelvic without adding bulk, increasing your flexibility and agility and at the same time toning your stomach and thigh muscles. Pilates goes far beyond your core muscles however and not only provides a complete body workout (you will be working muscles you didn’t even know you had! ), but also helps you develop an awareness of how your body works. Improved Posture– Pilates will teach you to gain and maintain good posture. Your spine supports the weight of your body and allows it to move with ease and comfort, but hours spent in front of a computer screen or slumped in front of a TV means that the spine’s natural S shape is lost, resulting in back pain and rounded shoulders. Pilates helps to re-align the spine and with that comes better posture. 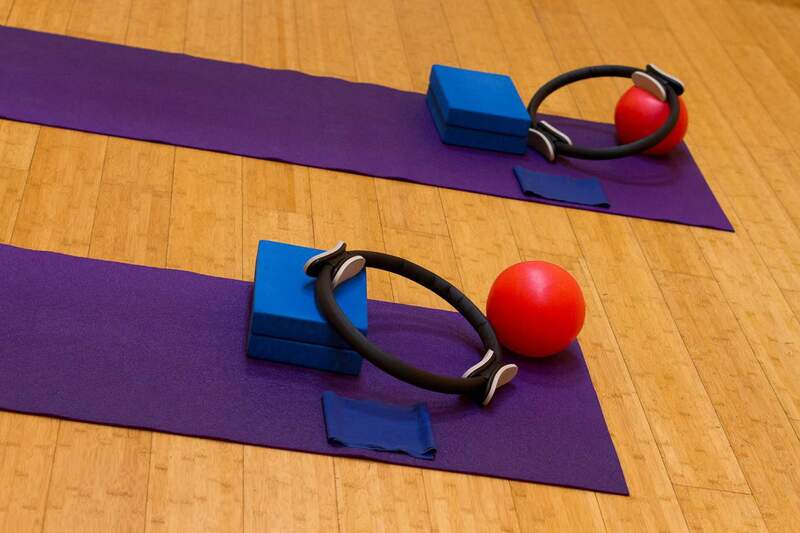 Improved Balance– Through the mind-body connection which is taught in Pilates you will become much more aware of how your body moves and performs. Therefore Pilates not only improves your physical balance through correct posture but will also restore your mind-body balance. Relief from Back Pain – As mentioned above, a great deal of lower back pain comes from poor posture and daily mistreatment of our spines. By re-aligning your spine and improving your posture, lower back pain can often be eliminated entirely. Reduces Stress– When doing the exercises, you’ll be totally engrossed and won’t be able to think about all those responsibilities that weigh you down on a day to day basis. You’ll be more focused on your breathing and on the moves that you are making with your body. This is an excellent way to relieve stress. Increase Energy Levels – Not only will doing Pilates give you the wonderful endorphin boost gained from most exercise routines, but it also improves circulation, which means you’ll breathe easier, stimulate your muscles and you will feel more alert and ready to take your day on. Flexibility– As we age we tend to lose the flexibility we had when we were young. Pilates will restore your flexibility, gently at first of course. After a while though, you’ll be amazed at how much more flexible your body has become. This is especially important for avoiding injuries from falls. We are introducing a new 6 week Beginners Pilates course on Tuesday 8th January at 12:30-13:30, in addition to the 5 Pilates classes already on our time table. With only 9 people per class you’ll get plenty of attention and expertise from the instructor, as well as the social and motivational benefits of group exercise. To book your space, please contact us on 020 8940 0888 or email info@earth-life.co.uk.